Description: Topdrawer’s website needed a UX overhaul and a design approach that matched up with the brick and mortar experience. 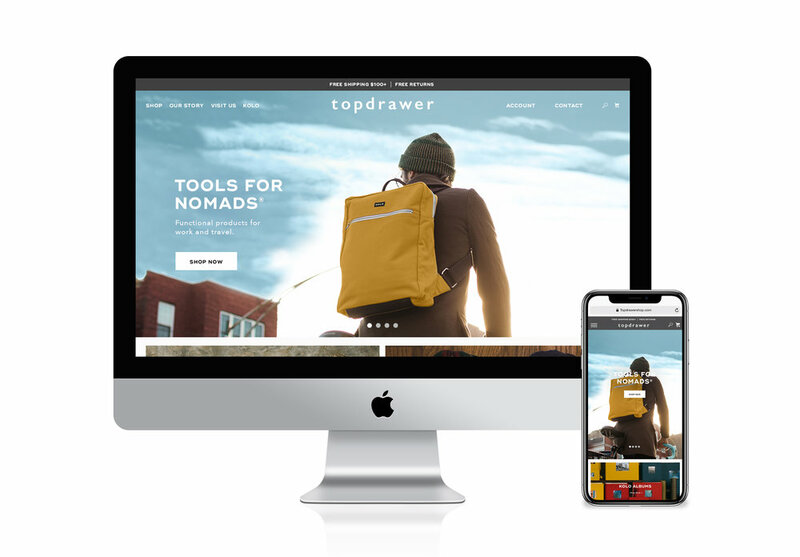 Previously Kolo.com (Kolo being a proprietary Topdrawer brand), Topdrawer now has a domain of its own at topdrawershop.com. Now the experience is more seamless for customers to visit us online after shopping in store, and allows for more consistent brand awareness. Customers can now shop a selection of Topdrawer’s products online that are carried in store. The website’s function is to be a resource that provides useful tools that creatives need most. This website is still in its early stages, and will continue to be built upon to be more dynamic and full of relevant brand inspiration that compliments the Topdrawer mission. E-commerce websites need to be straight forward in order to guide a customer through a sales funnel to make their desired purchase. The navigation is simplified down, the brand mission is explained upon landing on the home page so the customer understands the brand’s purpose as well as what is in it for them, our core categories are listed under the hero, and a selection of our stores are displayed to tie the physical to the digital.